Jim began collecting license plates in 1958, a scant four years after the founding of ALPCA. His entry into the hobby followed a typical path taken by many of the pioneering collectors: he casually located a cache of old plates, found them to be fascinating, and began a quest for more. In those days there were few others with whom an aspiring collector could network, so it was pretty much an individual task to build a collection. In Jim's case, the quest began with a group of Ohio plates back to 1911, located in a garage in his hometown while a college student researching a local history project. Jim joined ALPCA in 1960, and soon became one of the leading collectors of that era. 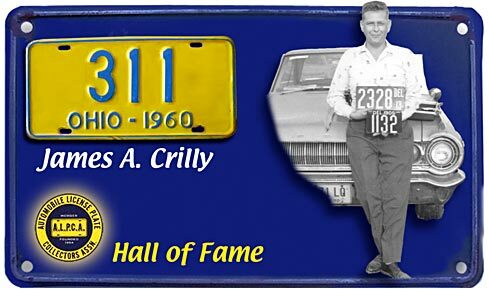 He was the first collector ever to assemble a complete set of U.S. porcelain passenger license plates - a feat that has been accomplished by perhaps as few as 10 others to this day (and remember Jim achieved his goal in a pre-internet, before-eBay age, when making a long-distance phone call was a special event!). Each and every plate in Jim's pioneering collection was acquired the old fashioned way i.e. : hard work and primary-source collecting: advertising, attending swap meets, and trading with the handful of active collectors of the time. Although he has since sold his porcelains, his plates have all gone into advanced collections where they remain as some of their new owners' most prized possessions. Of equal significance to Jim's collecting expertise is his three decades of service to ALPCA. He holds the unique distinction of being the only ALPCA officer to have served as President over three decades (79/80, 81/83, and 90/91). As an additional distinction, Jim held more offices in the club than any other member in ALPCA history to date. He served as 3rd VP, 2nd VP, Secretary-Treasurer, Editor, 1st VP, President, and Director - serving in one office or another for 14 of 17 years between 1964 and 1981. Jim hosted two national conventions in 1964 and 1968. Jim Crilly's contributions to ALPCA as a collector and office-holder are sufficient in themselves to merit induction into the Hall of Fame. There is one more factor - one which Jim may not admit to - that is well known to many of the old-hands: he is one of two selfless individuals who literally saved ALPCA from dissolusion and bankruptcy in the mid-l970's. During a period when ALPCA suffered from serious negative cash-flow due to a variety of circumstances, Jim and one other individual (also a Hall of Fame inductee) bet their own personal finances that the club would recover and prosper. That infusion of capital, done without regard for personal return, allowed the Newsletter to be published and the National Convention to he held. Without that spirit of generosity and selflessness, ALPCA might have ceased to exist. For all of the reasons noted above the membership welcomes James A. Crilly into the ALPCA Hall of Fame.